GRAND CHUTE, WI - The Wisconsin Timber Rattlers are gearing up for their 2019 season with some new personnel. Please welcome Chris Gosz, Jared Jirschele, Stephanie Nemetz, Justin Peterson, and Kyle Slaton to the front office of the Midwest League affiliate of the Milwaukee Brewers. Gosz is in his first season as the Executive Sous Chef for the Rattlers. The Neenah native has a Bachelor of Science degree from UW-La Crosse and an Associate degree from Le Cordon Bleu College in Minneapolis. Gosz, a 2016 "Chef of the Year" nominee by the American Culinary Federation, had previously been an Executive Chef at Holiday Inn of Appleton, Bridgewood Resort, and Riverwalk Hotel. Jirschele has joined the full-time staff as a Group Sales Representative after working with the team in a part-time and intern capacity since 2014. He had worked on the parking crew, as a ticket sales intern, and the Entertainment Coordinator Assistant. Jirschele is a graduate of Appleton East High School and UW-Fox Valley. Nemetz is in her first season as the Controller for the Timber Rattlers. She is a graduate of Saint Norbert College and was previously a Senior Accountant at a local manufacturing company. Nemetz was an Equipment Manager Assistant at SNC and a Cashier for the Green Bay Bullfrogs throughout college. Peterson is the new Stadium Operations Manager. He joins the club from the UW-River Falls where he was a Facilities Maintenance Specialist. Peterson, a native of Hammond, Wisconsin, is a graduate of St. Croix Central High School and Purdue University. He has also worked for Saints Sports Academy in Lakeville, Minnesota and with the Arkansas Travelers of the Texas League. Slaton, a member of the Sports Turf Managers Association since 2004, is the new Director of Grounds. The native of Bath, Pennsylvania and graduate of Penn State University joins the Timber Rattlers from Florida State University where he was the Assistant Athletic Director for Athletic Turf. Slaton had been at Georgia State University - where he won the 2014 STMA College and University Soccer Field of the Year award - prior to his time at FSU. He has been a turfgrass intern with the Milwaukee Brewers, Philadelphia Phillies, and Philadelphia Eagles and was the head groundskeeper for the Frederick Keys of the Carolina League. 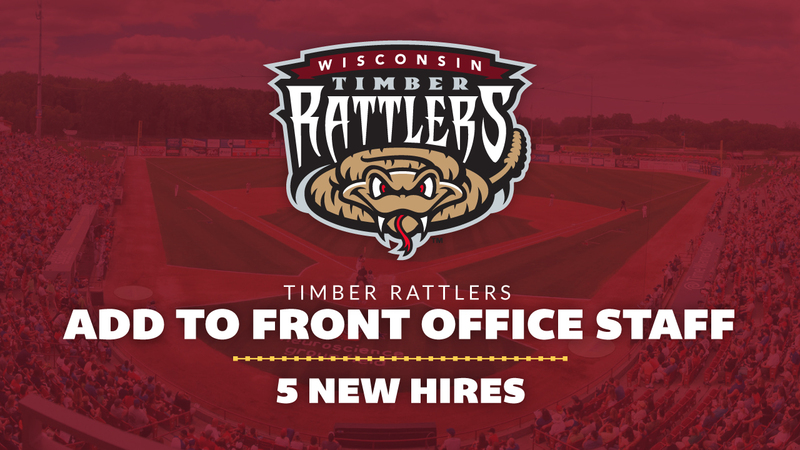 There are 28 full-time staff members in the Wisconsin Timber Rattlers front office.